Those of us fortunate enough to live in the Upper Missouri River area, know what a wonderful place it is. We want to tell those stories! To do so, we’ve brought together residents, multi generational landowners, local businesses, nonprofits, and cultural organizations. We believe in private property rights, celebrating our history, honoring our legacy and sharing our stories with others. 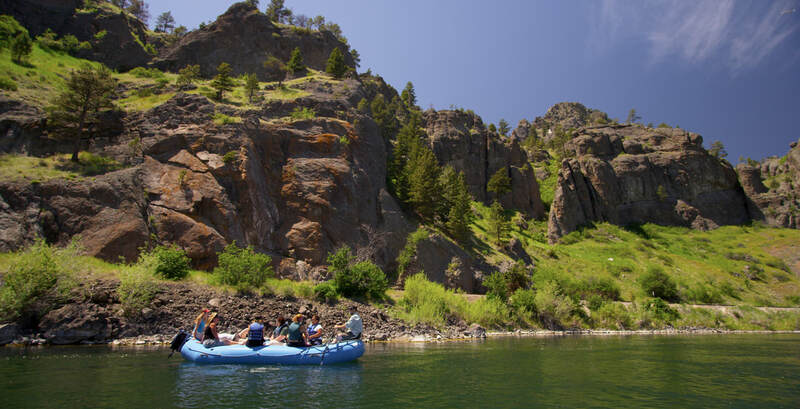 We believe that the stories and history of the Upper Missouri River area have national significance, and that National Heritage Area designation will bring vitality and sustainable economic development to our region. The City of Great Falls and the Great Falls - Cascade County Historic Preservation Advisory Commission asked the community to join them for the Grand Tour of Great Falls event on January, 2015. This gathering of over 100 local and regional community members began collaborative efforts to establish a National Heritage Area along the Missouri River Corridor. Some of the early funders of those resident meetings included the State Historic Preservation Office (SHPO) and the Great Falls' Tourism Business Improvement District (TBID). A successful Grand Tour II event took place on April, 2016 and was again well attended by nearly 100 members of not only the Great Falls community but the region at-large. The Upper Missouri River Heritage Area Planning Corporation (UMRHAPC) received official 501(c)(3) designation in June, 2016, at which time they formed a Board of Directors. The Board is still growing and is meeting on a monthly basis. Meetings take place on the 4th Monday of every month in the Gibson Room at the Civic Center at 4 pm. For a DRAFT map of the proposed Heritage Area boundaries, click here. Note that at present the proposed boundaries are those lands in the flood plains of the rivers, primarily the Missouri River, and its tributary rivers. We've chosen six tentative themes for the Heritage Area: Ice Age/American Indian, Exploration/ Settlement, Transportation,Military, Industrial/ Agriculture, and Art. The UMRHAPC has four committees: Fundraising and Marketing, Public Engagement, Heritage Database, and Executive, which also meet monthly. There are or have also been a Feasibility Task Force and a Boundaries Task Force. To date, we have raised over $50,000 for the proposed Heritage Area; this has allowed us to hire an consultant team to prepare a Feasibility Study to determine whether we should proceed and what our options are. The Feasibility Study will be eventually submitted to the United States Congress to make the case for this prestigious designation. Additional monies go to operational costs, such as filing fees and website design. For more information, please contact Jane Weber, Chair of the Upper Missouri River Heritage Area Planning Corporation Board of Directors at (406) 454-6814. Email Jane if you would like to be added to our email list, so that you know when the next public meeting is or when we send out the latest news and information. Lewis & Clark Trail Heritage Foundation, Inc.